Foraging and Feasting: A long weekend of foraging walks, sunset aperitivos, city strolls, fabulous cooking, cookery classes and fascinating WSET wine sessions that will see you returning home well rested and wine knowledgeable. Enjoy long breakfasts or/and some gentle exercise with a yoga class by the pool. Daily wine classes are relaxed and fun, and work up quite an appetite, fabulous lunches are served overlooking the Siena hills. Afternoons are for sunbathing, or excursions into the city of Siena for shopping, sight seeing and an aperitivo in Italy’s most impressive piazza, Piazza del Campo. Throughout the weekend we have an amazing chef cooking for us, he will be presenting masterclasses for those who are keen to learn how to make fresh pasta, focaccia and risotto. To supplement the food workshops we will head out into the woods around the villa to forage for edible plants, flowers, wild leaves and herbs with a local expert - and evening meals will be enjoyed with the villa’s wines that are liquid translations of this stunning landscape. This long weekend is shaped around the Level 1 WSET course - a beginner level introduction to wine suitable for all those pursuing an interest in wine. This qualification provides a hands on introduction to the world of wine, In three morning sessions you will explore the main types and styles of wine through sight, smell and taste, while also gaining the basic skills to describe wine accurately, make food and wine pairings and feel confident in spotting a faulty wine. Upon successful completion you will receive a WSET certificate and lapel pin. 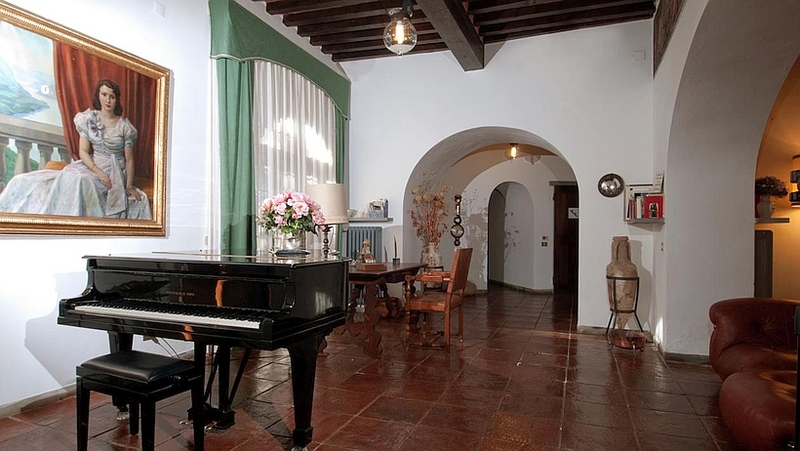 La Torre alle Tolfe is a private hilltop villa centred on an 8th century tower ‘La Torre’ with 17 beautiful bedrooms. 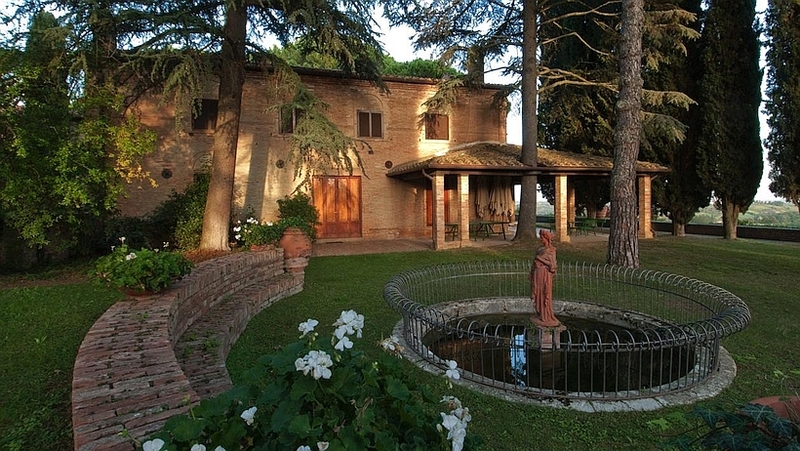 Set in landscaped gardens amongst vineyards and olive groves but a mere 3km from the remarkable Medieval city of Siena. 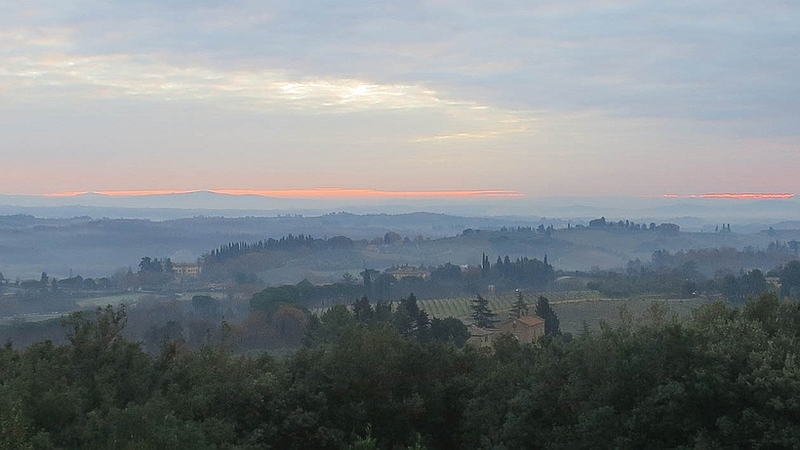 The estate covers 100 hectares of fields and forests, extending over rolling hills towards Siena, and out towards the heart of the Chianti region. There are spectacular views in every direction. The entire property is run as a certified organic farm, producing a variety of wines, and premium olive oil, with the arable land producing a variety of organic grains and pulses. The lack of pesticides and other intensive agrichemicals means that the fields and forests are also home to a rich fauna and a remarkable variety of wildflowers. 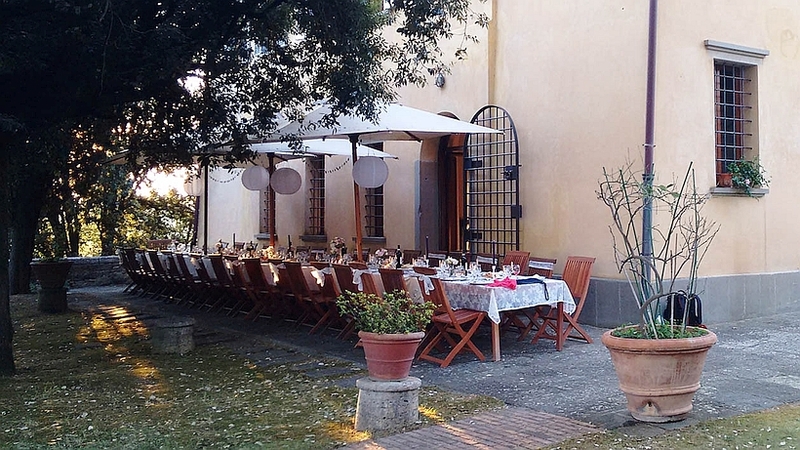 The Villa was furnished by the Castelli family over several decades, and their love for the Tuscan history and art is reflected in the furniture, art and artefacts throughout the Villa. Spacious rooms on the ground floor include an elegant dining hall and two comfortable sitting rooms. Upstairs, guests can enjoy a large billiards room with views over the garden. 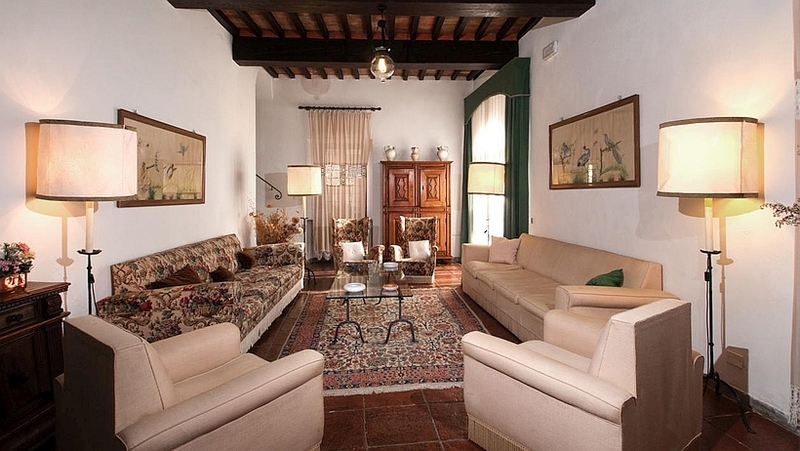 Each of the 17 spacious bedrooms has been named after one of the 17 contrade (districts) of Siena. The rooms are spread over three floors, with lift access. The traditional, thick, stone walls help to keep the house cool through the summer months. Outdoors we have a “bocce” court through the olives, a short distance from the villa. Bocce is a characteristic Italian game, similar to bowls. The court lies in the dappled shade of a small woodland. Atmospheric lighting also allows games to be played in the evenings. There is also a hard tennis court in the shade of tall evergreen oaks. Indoors there is a billiards table, or guests may want to try their hands at the more traditionally Italian game of funghetto biliardo. Guest are welcome to explore the wider estate – walking or even trail running. 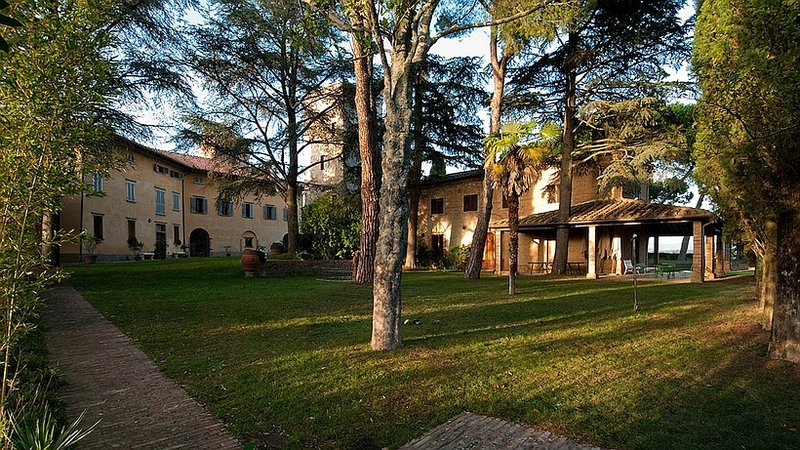 The estate extends over a mosaic of olive groves, vineyards and woodlands, criss-crossed with tracks and paths. Trekking around Le Tolfe guarantees beautiful scenery and an opportunity to discover the local flora and fauna. 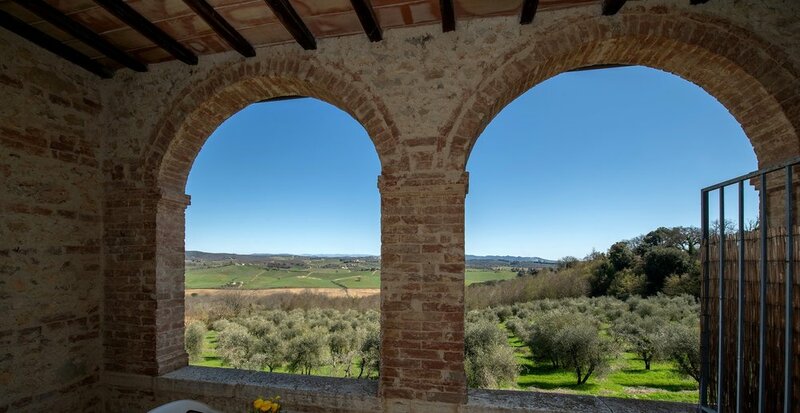 For the more adventurous, it is possible to walk, or cycle, beyond the property, and to explore the adjacent Chianti region rich in places of interest. 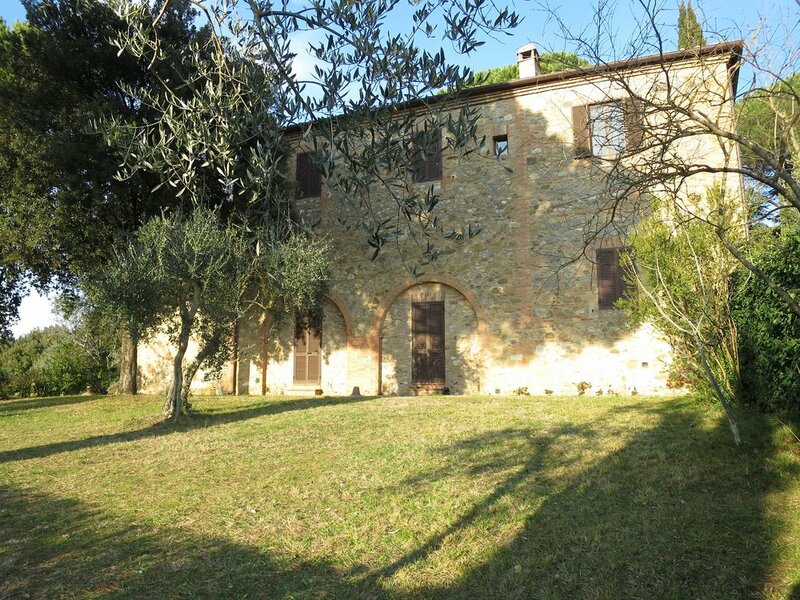 Nearby, these include the former monastery of Pontignano and its well-known Italian gardens, the Chianti Sculpture Park, Brolio Castle, the borgo or hamlet of Monteliscai, and Trecciolino’s Palio horse-training yard. All lunches and evening meals will be prepared for us by chef Avinash Shashidara. Avi has worked at some of London’s top restaurants including The River Cafe (he left only last summer, 2018, after ten years of service) and two Michelin Starred, Hibiscus. His cooking is unfussy, unpretentious and off the charts delicious. He will be cooking using vegetables from the villa ‘orto’ (vegetable garden), grain from our fields, and the fruit trees on the estate, apricots, plums, figs, cherries. Meat, and fish are sourced from local organic and free range producers. Guests are welcome to pop into the villa kitchen at any stage to see Avi preparing our meals, though there will be organised cooking demonstrations that will be interactive to allow participants to learn how to make pasta, focaccia and risotto. 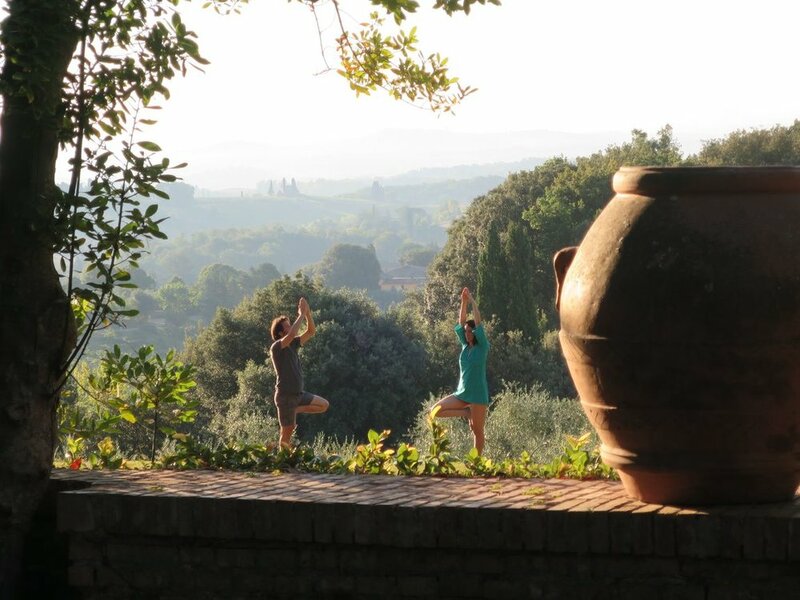 For those who like to start their day with a spot of stretching and mindful breathing, we have daily yoga with meditation classes starting at 7:30 by the pool or in the Limonaia (a studio in the lemon tree’s “winter home”). There are also tracks for runs and hikes around the estate for those keen for a breathtakingly scenic start to the day. WSET Course Level 1 Tuition and all course materials, study guide, stationary, food and wine samples (over 20 wines from around the world will be tasted including the wines of Champagne, Bordeaux, Burgundy and Barolo) and exam. Please click the SIGN UP box and fill in the form - You will be contacted via email or phone - whichever you prefer to organise and confirm your booking. Very much looking forward to meeting and raising a glass or two with you! 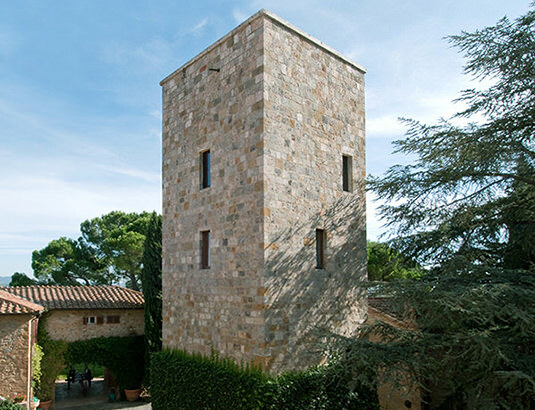 The name, La Torre alle Tolfe, tradition has it, comes from a certain Tolfo dei Gricci, one of Charlemagne’s knights, who first built a tower and castle here around 785 AD. It would have served as a lookout point on the emperor’s route between Lyon in France and Rome. Welcome aperitivo on the terrace overlooking the gardens and pool, and Wine Tasting of the villa’s wines. Evening meal with all the villa wines to accompany a traditional Italian meal. Lunch followed by a late afternoon trip into Siena. Free time for shopping and gelato, Meeting at 18:30 pm for aperitivo in Piazza del Campo. Dinner back at Le Tolfe celebrating the ingredients of Summer - basil, aubergines, peppers, tomatoes, peaches, courgettes, plums and figs! Time to relax by the pool, or in the gardens of the villa. A tour and tasting at Villa di Geggiano, Castelnuovo Berardenga. 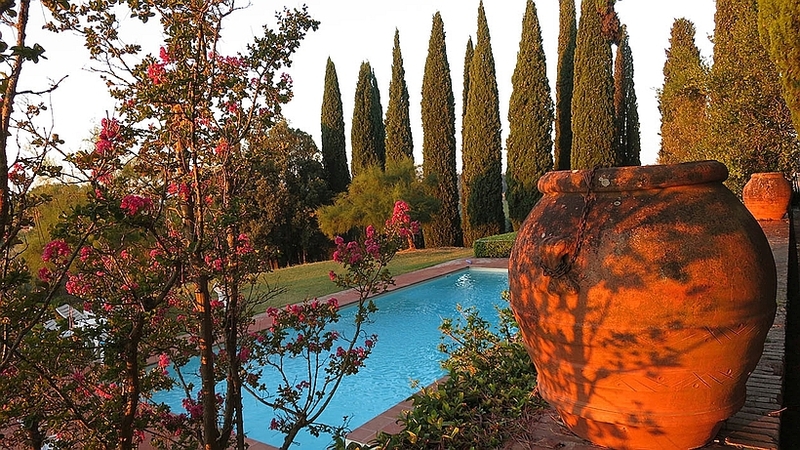 Villa di Geggiano produce fantastic Chianti Classico at their extraordinary estate - a neo-classical style rural palace with an outdoor theatre. Like Le Tolfe, they are an extremely lovely family with wonderful wines and stories to tell. Dinner back at Le Tolfe. Daily yoga, Breakfast, Wine session “Common wine faults, service and storage” and short Multiple Choice exam. Freetime to relax by the pool or in the villa gardens. Foraging walk to collect wild herbs, edible flowers and leaves for later cookery masterclass. Pasta and Risotto Masterclass followed by dinner.